The first fresh fish of the Spey season was caught on opening day by Davie Leith, 80 years young, at Kinermony. The lower river up to Craigellachie started the season in fine fettle, with fish reported and anglers who ventured out enjoying some excellent sport during the mild weather. Rods below Craigellachie fared better steadily picking away at fish. Most beats during Feburary and March were lightly fished with plenty of affordable rods available for visiting anglers. Notable February catches: Alan Rennie 13lb Delfur. Gordon Castle 11lbs. March and a mixed weather forecast, a scattering of snow and bitterly cold easterly wind did not suit the river. Tulcan registered their first fish spring salmon of the season. Beats futher up river started catching fish, though the lower part continued to produce more fish. Abertnethy Angling Association caught their first and registered 2 fish for March. Grantown Association Water rods caught their first fish. 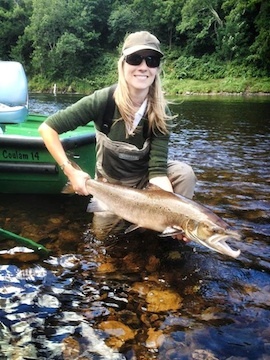 Spey beats remained lightly fished. Notatable March catches; Tony Palmer 23lb, Charlie Whelan 13lb & Craig Campbell 18lb’s all from Gordon Castle water. April saw unsettled weather, a high and coloured river, which thankfully moved fish across the system. Anglers caught fish from Grantown to Fochabers. Grantown Association rods registered 14 salmon. Notable April catches; Neil Cameron 21lb Delfur, Paul Davidson’s 23lb and Hasse Larsson 20lb Gordon Castle and a 21lb salmon to a rod fishing Arndilly. The largest fish of April at 25lb caught by Chriss Hallas fishing Craigellachie beat, using a turbo disc fly. A total 437 spring salmon were caught by rods fishing from 11th February to 30th April 2013, just 4 short of the previous years total of 441 in 2012. The river was lightly fished during February & March with many beats having very few or no rods fishing. On a positive note Spring fish released during 2013 has increased to 92%. By mid May after mild weather and prolonged rain, the river finally was perfect. May salmon which the Spey is renown for arrived in decent enough numbers for most beats to enjoy some excellent sport. Delfur had one of their best weeks of the season. Wester Elchies had an execllent week with 19 fish. Craigellachie had their best month of the season with 26. Grantown Association rods had 56. A total of 923 salmon were registered across the river. If the person you’re buying for loves to go fishing You can’t go wrong with a FishPal Fishing Gift Voucher. The recipient can choose from over 700 fisheries on our system. You choose the value and let us do the rest….simple.